I’d use paint, but that’s just for appearance. Treated lumber will last a very long time without anything. 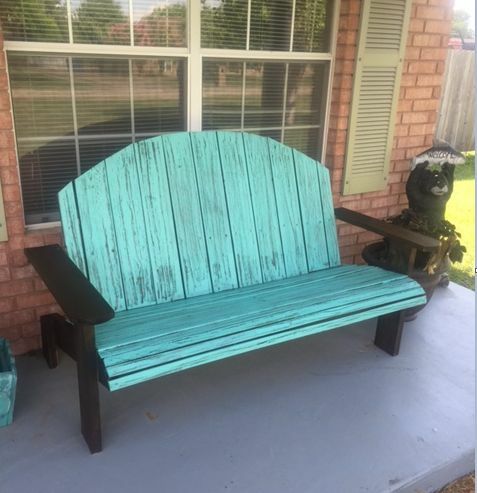 It does need to be dry before you paint it, then prime with a good primer (preferably an oil based) and paint with a 100% acrylic exterior paint. But that’s just me….. I built this a few months ago. I let it dry for a month then stained it with some good ole minwax and then paint/weathered it with some good PPG exterior paint. It was my first time doing that kind of finish and I’m pretty happy with it. Paint, use a oil based primer and it will last a long time. Do let it dry out before beginning the entire process. Yes you can paint PT lumber but it has to be completely dry. I’ve done it many times with trim on houses. If it is outside in the weather it will never completely dry. If this is the case, I would simply coat with a decking sealer. Thanks for the suggestions. The Mrs. likes the natural wood look, so I think Thomsons water seal is going to be the way I go. About how long do I need to wait before applying? A year? Maybe next spring? Also, do I sand before applying? @woodbutcherbynight Cool stairs. What would be the reason you need to regularly get on the roof? 1) when the wood dries a little, it’s probably ready now. 2) No, but you might want to clean it a little if any crap and such fell on it. I am a little confused by what your question is and what are you concerned about. The 4×6 PT lumber does not need anything done to it for protection, even with full ground contact. Adding Thompson water seal will not add any additional protection to the Alkaline Copper Quaternary(ACG) that was driven into the wood fibers under pressure. Most likely the Thompsons will bead up and run off. You will not be hurting anything, but you will be wasting your money. Painting will offer the best protection against UV damage. Let it dry for about one month, sand all body contact areas, (arms, lower fronts) to prevent splinters. soak down with Thompsons water seal and let dry for 24 hours. I use a pump garden sprayer to apply with. Every spring, lightly sand contact areas and spray with Thompsons. OK, so it sounds like the rough consensus is if applying Thomsons Water seal, let it dry for about a month and reapply every year? Are there any things to look for when looking at the wood to determine dry enough to have the seal applied? Big box PT can be REAL wet. I’ve had juice running out of it from drilling a pilot hole. Very fresh PT runs about 35% or more. Drying time will vary enormously. A high humidity climate in the shade…it might take forever. In the Mojave desert in the sun….lets just say less. Thompsons doesn’t hold up to weather long. Do it twice a year. You may want to tip your couches over and smear something on the end grain of the legs so it doesn’t wick water up. Just feel the wood, if it is cool or damp to the touch it’s too wet. It will feel warm and dry when ready. The purpose of the Thompsons is to prevent absorption of moisture. Once a year is plenty and the wood will weather out to a nice gray like you want. Clean the gutters, install lights, minor repairs to roof, pressure washing, all things I did not want to get out a ladder for. 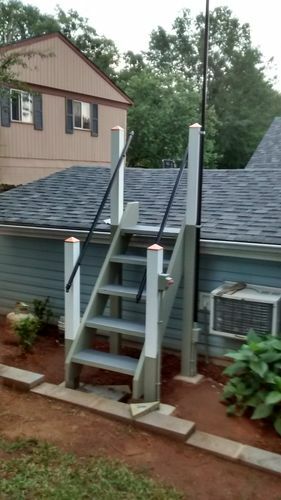 As my shop wall is 4 ft buried into the landscape this staircase allows access to the shop roof and from that roof the entire house behind it. Not practical for most but with the lay of the land it works well.